The decision as to who reviews what goes fairly smoothly between Cathy and I until there is a new Scientists in the Field book, then, Watch Out! I won this time because Cathy is allergic to cats! 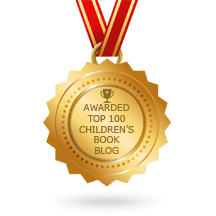 What we love about the series is the variety of fascinating topics, the quality of writing, and the stunning photographs. Chasing Cheetahs: the race to save Africa’s fastest cats continues the tradition. It is by far one of the best books about these beautiful mammals...the fastest predatory animal on Earth. Sibert Medal winners, Sy Montgomery and Nick Bishop are a terrific team. Montgomery’s prose is perfect and though packed with lots of scientific information, the narrative is riveting and never overwhelms the reader. In Chasing Cheetah’s, the dynamic writing team travels to the Cheetah Conservation Fund’s headquarters (CCF) in Namibia, Africa where they meet Laurie Marker. She and her team work tirelessly to save the cheetahs from extinction. In Namibia many cheetahs are shot by African farmers thinking they are after their livestock. When Marker moved to Namibia from the U.S.in 1991, where 20 percent of the cheetahs live, she began visiting farmers and asking the questions that lead to a surprising conclusion: The way to save cheetahs is all about people, goats, and dogs. Accompanying the text are lots of photos taken by Nic Bishop. His keen eye and steady camera has captured some phenomenal scenes of the work being done at the CCF. Most of the pictures are of cheetahs, but I have to say my very favorite is of a chameleon cautiously marching across open ground found on page 45. Sidebars with additional information that are placed throughout do not detract from the flow of the narrative. In fact, they enhance the reading experience. Montgomery is a master at making complex scientific information accessible. For example, read her explanation on "Secrets of DNA." 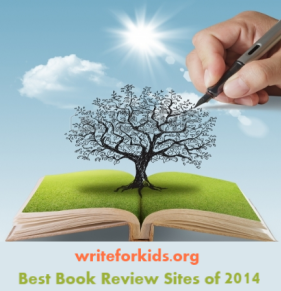 Rounding out this award-worthy book is a bibliography, photo credits, and index. 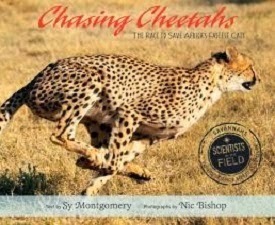 Chasing Cheetahs is great addition for middle school summer reading lists.